Swiss International Mabisel is at No. 9, Mabisel Avenue Off Peter Odili in Port Harcourt, Rivers State.‎ This hotel combines beautiful designs and luxury accommodations to create an inviting ambience for guests to enjoy. It features free Wi-Fi and an outdoor swimming pool fitted with loungers. The rooms are elegantly furnished with several in-room amenities to satisfy the needs of hotel users. 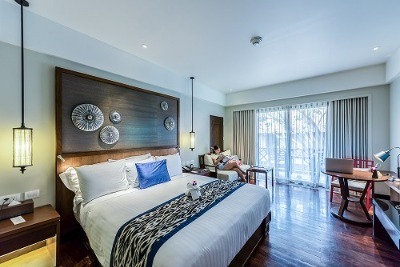 The amenities include air-conditioner, king-size bed, satellite TV, mini bar‎ and aesthetically designed bathroom/toilet system with a hairdryer. These rooms are categorised into Superior, Deluxe Rooms, Diplomatic and Presidential Suites. Breakfast is served at a surcharge. Recreational facilities like the swimming pool flanked by recliner seats and tables, and a gym ‎centre can be fully utilised by guests to their advantage. A spa is available at the hotel; the on-site restaurant serves a wide range of local and continental meals and the bar is fully stocked with different kinds of drinks. Adequate parking is available and the complex is guarded by security personnel. A business centre which provides business services is also available at the hotel. Swiss International Port Harcourt also has a conference centre to host weddings, meetings and other kinds of gatherings. Additional services such as express check-in/check-out, airport shuttle, laundry/dry cleaning, babysitting, ironing, car hire, a 24-hour room service, luggage storage and concierge, are made available on request. Children: All children are not older than 12 allowed to stay for free. Q: Does Swiss International Hotel offer free Wi-Fi? A: Swiss International Hotel offers free Wi-Fi to all checked-in guests. Q: Does Swiss International Hotel have a swimming pool? A: No. Breakfast is served at a surcharge. Q: Is there a fitness centre/gym at Swiss International Hotel? Q: Does Swiss International Hotel have a restaurant? A: A restaurant is available at Swiss International Hotel. Q: What is the check-in and check-out time at Swiss International Hotel? Q: Does Swiss International Hotel offer shuttle services? A: Swiss International Hotel renders airport shuttle service on request. A: Swiss International Hotel renders car hire service on request. Swiss International Mabisel Port Harcourt is a top-class hotel in Port Harcourt, Rivers. The hotel was easy to locate, beautiful and quiet. Customer service was excellent and all facilities were put in place. Clean towel and toiletries was available in the bathroom. I really enjoyed my stay. My stay at the hotel was wonderful, the hotel was clean and comfortable. Their food was delicious and affordable, the bathroom was clean, toiletries was available, power supply was uninterrupted too. I am impressed. The decor was dated and the rooms had no centre rugs for warmth. The management services were not so customer friendly. We weren't told complimentary breakfast ended by 10am, and you had to eat in the restaurant else you were charged 4000 naira for the complimentary breakfast. Will never stay there again. Have nice pictures of Swiss International Mabisel Port Harcourt?